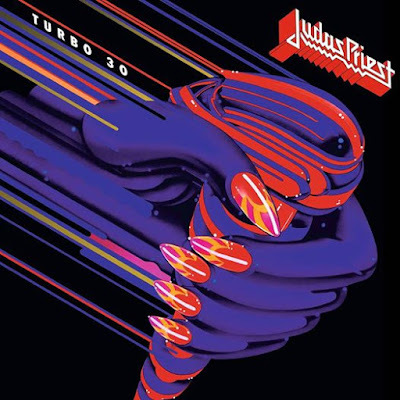 Judas Priest will mark the 30th anniversary of their 1986 album, “Turbo”, with the release of an expanded reissue on February 3. The package will include a remastered version of the original album alongside audio of the band in a May 1986 concert at the Kemper Arena in Kansas City, MO. “The 80’s is considered to have been the best decade for heavy metal,” says the group. “Judas Priest roared through it and at the half way point went into unchartered territory with ‘Turbo’. Always believing that metal should have no boundaries, Priest challenged themselves taking on board new technical inventions to create fresh ideas and push their sound forward. The combined songs show another side of Priest’s range of creativity that captures a theme and energy infused with the over the top sensibilities of that era. Judas Priest’s use of guitar synthesizers on their tenth album was evident in tracks like the lead single, “Turbo Lover”, as the record peaked at No. 17 on the US Billboard 200 on its way to sales of more than 1 million in the country. The “Turbo 30” reissue will be available as a 3CD set, LP and via digital download. “We've just been in the studio for a couple of months putting songs together,” guitarist Richie Faulkner revealed recently. “We're recording demos; we're putting down some grassroots ideas and fleshing them out for the next Priest record. We're gonna go into the studio to start recording in January. So it should be out sometime next year. But we're not touring next year. So we're gonna be touring, hopefully, in 2018."